Bus lines 50, 60S and 81 until final destination "Botanischer Garten"
Drive from Olshausenstraße into Leibnizstraße. Park at the end of Leibnizstraße at your laft on the parking area. ... along the building with curved facade enter the 12 floor high tower of the Biology Center . Follow the signages "Botanisches Institut". There you will find us in the basement. Alternativly, go at the end of Leibnizstraße to your right down the street "Am Botanischen Garten". You will find a side entrace across the depot directly entering the basement. Go left and at the end of the hallway left again. 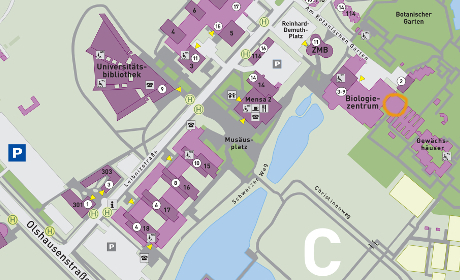 By clicking the image you will get a plan of the campus in A4 format as pdf-file.